Yes, there is an antitrust case against Amazon. An antitrust case against the retail behemoth isn’t likely or obvious. But it is possible—and necessary. 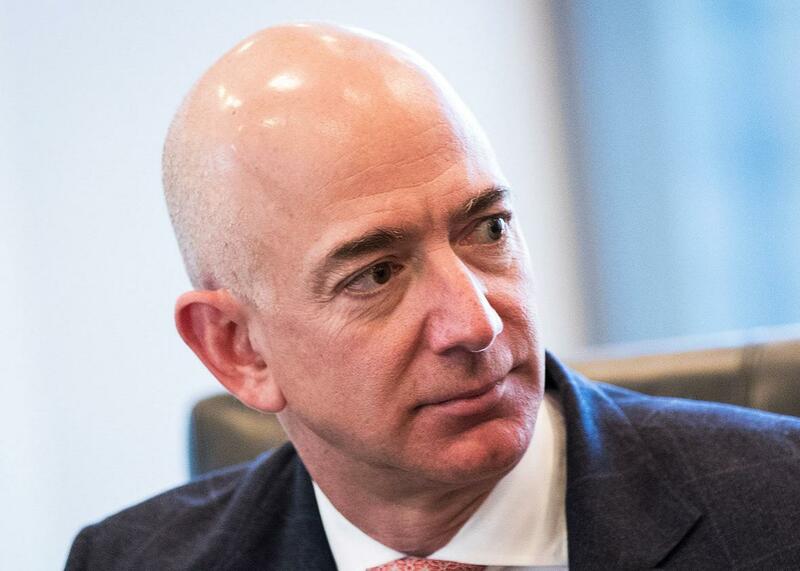 Jeff Bezos, CEO of Amazon, during a meeting of technology executives at Trump Tower in New York City on Dec. 14. Amazon is now the most interesting and important problem in American antitrust law. While it was hardly the first step in the firm’s competitive evolution, Friday’s breathtaking news that the e-commerce giant will acquire Whole Foods brings into sharp focus one of the deepest tensions in our antitrust law as it has evolved under 40 years of conservative orthodoxy. Amazon is enormous, and it is apparently rapacious and remorseless. But at least superficially, it has done nothing in its 20-year life but sell things more cheaply and innovatively than its competitors. That is to say that it’s done just the thing that antitrust law says firms are supposed to do: It has competed on price and quality. The law has therefore proven persistently uninterested in its conduct. To many critics, that antitrust is so helpless in the face of a firm so big, acquisitive, and devastating proves how badly it has failed. Its failure, then, reflects an even larger tension, especially on the American left. The struggle is between the haughty pride of our establishment institutions and their apparent impotence against the power and greed from which they are supposed to protect us. The fear and resentment of the poisonous 2016 Democratic presidential primary was driven by nothing less. The better news is that debate over Whole Foods, which seems likely to be pretty lively, could be a bit of a watershed moment for our competition policy. Ideally, recognition might emerge that antitrust as it has evolved, including even its general, simple focus on price competition and protection of consumers, is actually a reasonably tolerable policy. It generates good outcomes most of the time and could get better yet just with more vigorous enforcement and popular support. But hopefully we also will see that a firm like Amazon embodies some things that are wrong with the policy and that it calls for action. That action could actually be taken in the Whole Foods case, and it is not even impossible that the Trump administration might take it. There are a few theories of actionable anticompetitive harm, even on our existing law, by which the government could bring challenge. They will require digging more deeply than the superficial story that Amazon will tell in its own defense, but they won’t require any radical change to the law we’ve got. The new administration ought to take them seriously. Up until now, the mainstream antitrust establishment has been pretty quiet about Amazon, no doubt because its visible conduct fits awkwardly with current ideas of what should be illegal. The Whole Foods acquisition could change that, if for no better reason that it represents a new level of audacity. Though Amazon has acquired hundreds of other firms in the past, some big and many controversial, never before has it bought a significant brick-and-mortar operation. Over the years, as its critics have raised increasingly urgent alarms and elaborated on the firm’s history of fairly nasty aggression, what’s angered them most have been Amazon’s tentative forays into terrestrial stores of its own. They seem to confirm a deliberately predatory, monopolizing strategy: Amazon kills off brick-and-mortar retail competition through desperation prices, only to take over those rivals’ physical presence as soon as they are gone. This new deal is also a big one in absolute dollars. While Whole Foods is by no means the largest American grocer, and the deal’s $14 billion purchase price is not the biggest by any stretch, Whole Foods is among the larger chains in an industry worth upward of a trillion dollars per year. And of course, unlike any of Amazon’s prior targets, Whole Foods is among the best-known names in American retail. But still, an antitrust challenge is quite unlikely. Nowadays, the federal antitrust agencies almost never challenge mergers unless they are “horizontal”—between head-to-head competitors—and they cause very high levels of concentration. This merger is only barely horizontal. The firms’ only overlapping business is online grocery, which so far remains a vanishingly small share of overall grocery. Even if (as seems unlikely) a court found there to be a legally relevant market consisting only of online grocery sales, no serious challenge would be likely. Amazon is a big player in that small space, but Whole Foods is small within it, and there are plenty of other would-be players. Moreover, Amazon will tell a seemingly plausible story to regulators and courts—that it only means to buy a troubled firm in need of a boost and only to support its entry in a space that it could not successfully enter on its own. Amazon has been trying to get a foothold in grocery for a decade, but its only real success has been in England, where it has partnered with the traditional grocer Morrisons. Meanwhile Whole Foods has been stuck in a yearslong doldrums and this year came under dire pressure from Wall Street. Vigorous challenge from mainstream chains and superstores led to a loss of nearly half the firm’s share value over just a few years. Then, just two months ago, a surprise incursion by an activist hedge fund bred immediate speculation that Whole Foods was on the auction block. First is the argument that Amazon will acquire Whole Foods mainly to kill off an online grocery rival—not now but in the future. This argument would take the deal not so much as “horizontal” and so would begin at a disadvantage. But antitrust protects “dynamic” as well as static competition, and mergers are illegal where they will thwart technological or other developments that pose future competition. Amazon has a history of such maneuvers, as in its notorious, bare-knuckled acquisitions of Zappos and Diapers.com, as well as dozens of smaller acquisitions of otherwise threatening startups. While online grocery is now small, the industry plainly expects it to grow, and while there are currently several would-be entrants, there are specific reasons to expect that this combination will make their futures very, very bleak. Better yet, a second theory would challenge Amazon’s conduct overall. A range of its particular actions over a few decades potentially makes out a claim, even under our current antitrust law, of illegal monopolization (in technical terms, a claim under Section 2 of the Sherman Act, rather than a merger challenge under Section 7 of the Clayton Act). The claim would be that this new acquisition and a series of prior acquisitions and other actions have delivered a market position in which Amazon is such a powerful buyer that it can force its suppliers to sell at subcompetitive prices. While monopsony claims are rare and difficult to bring, Amazon is no ordinary antitrust defendant. To prove the claim, the government could first show that Amazon has very large shares of sales in specific products and that those shares reflect actual market power because Amazon has acquired truly, historically unique economies of scope that no retail entrant could meaningfully challenge. The government could then show that these shares were acquired not by healthy, price-competitive vigor (in which case they would not be illegal). Rather, they were gotten through a series of acquisitions that may not have been individually illegal but in combination were monopolistic and by other exclusionary acts. A variety of the latter are well-documented, as, for example, Amazon’s use of its Amazon Marketplace platform to gather analytics on its Marketplace partners, then to enter their markets while using its data advantage and crushing terms to overtake the space. While President Trump’s antitrust leadership is not yet in place, his team appears most likely to consist of well-seasoned lawyer’s lawyers with sterling credentials in antitrust (specifically, Makan Delrahim and, as it is rumored, Joseph Simons). That they are also very conservative does not mean they won’t bring important cases, and this could be one. And the significance of it could not be overstated, not only because of Amazon’s own size and danger but for the broader revitalization it would bring to this crucial policy.